Perhaps it is just confirmation bias at work, but I really think the New York Times features a disproportionate number of lofts in it’s feature sections on Thursdays and Sundays. The latest example is the Habitats feature in yesterday’s real estate section, A Jigsaw Puzzle That Sleeps 4, about a West 15 Street loft expanded and adapted by an architect as his family grew. As I said in my November 4, that bento box loft in Noho also provides a Quote Of The Day, the height in many lofts gives creative people more to work with than in typical apartments, so some of those creative responses become noteworthy (or Times-worthy). This may be especially so with relatively small lofts, like the (probably 1,200 sq ft) Jigsaw puzzle, or the 1,300 sq ft bento box, or the small-loft+shoe-closet that I hit on November 7, another loft in New York Times, another inexpensive renovation, with 400 shoes. The slideshow that accompanies Constance Rosenblum’s Habitats feature yesterday focuses on the details and (typically) does not contain a floor plan. The exterior photo with the loft lighted gives a sense of the shape, the kids’ living room photo (pic 12 of 14) establishes that the kids’ wing is the corner, and the parent’s lofted bed photo (pic 7 of 14; with a window view across Sixth Avenue) means that the parent suite is south, facing Sixth Avenue. The kitchen is just off the kids’ living room (seen as a glimpse in the left of the first pic) and behind the son’s bedroom (note the two views of the hatch ‘window’ through the wall from the kitchen in pic 3 of 14 and from the son’s room in pic 10). 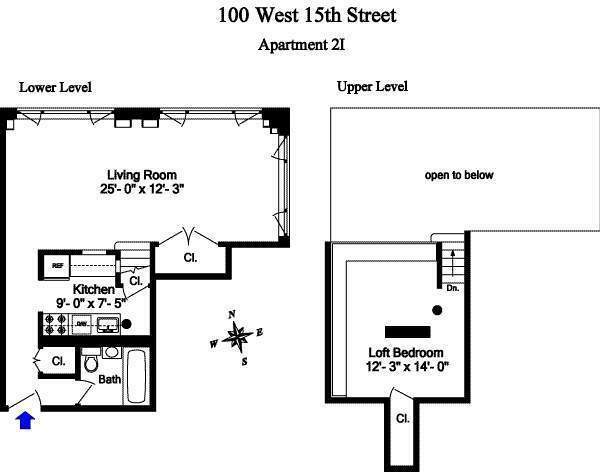 The text explains that the original part of the loft is now the parent suite (those first 2 windows on the left in pic 2 of 14), which had been a 700 sq ft 1-bedroom apartment. The architect/dad lived in the building since the mid-1970s, as a fresh-out-of-Harvard-architect renting a “$98-a-month studio on the building’s fourth floor”, from which “[i]n 1982 he moved to [the] one-bedroom on the third floor”, which he and his (new) wife bought in 1985 for $35,000 (that is $50/ft), apparently an insider price when the building was converted from a rental to a coop. neighbors across the hall told us they were leaving and asked if we wanted to buy their apartment. Mr. Ranalli then embarked on an eight-week renovation marathon to combine the spaces, a whirlwind $300,000 undertaking …. They moved in just a few days after the son was born on July 19. So they went from pregnant and needing more space in February to all moved in to a gut renovated combination of about 1,200 sq ft by July. Net, net, they spent $35,000 in 1985 for the first piece, $295,000 in 2002 for the second piece, and another $300,000 in 2002 for the renovation. At 1,200 sq ft, that’s $630,000, or $525/ft, which was hardly cheap within the 2002 market. But it kept them exactly where they wanted to be (where he had been for nearly 30 years already, and she for nearly 20), in space that was (obviously) perfectly suited to them. A small set of stairs leads to the couple’s loft bed, which sits atop a construction honeycombed with drawers and cabinets. In this room as elsewhere, storage space is tucked into every conceivable corner but so artfully concealed that it’s all but invisible. With (only) 12 foot ceilings, I wonder if he stands up in the loft. The daughter’s bed also sits on a yacht-worthy jumble of storage, but the son’s room seems not to have taken advantage of the height. (Perhaps when he is older….) When you know exactly what your client (family) needs, you can design within an inch of pain, I guess. As with the bento box family, to ask what about resale? is to introduce an irrelevancy into the client’s enjoyment of the space. It works for them, with all the hidden storage and visual tricks to ‘expand’ the space. Who cares if anyone else would like it? 1 Pings/Trackbacks for "NY Times loves the architects who (live in +) love lofts / West 15 Street Lego edition"